Guided kayaking tour along Roqueta Island including lunch on the Caltia Beach. 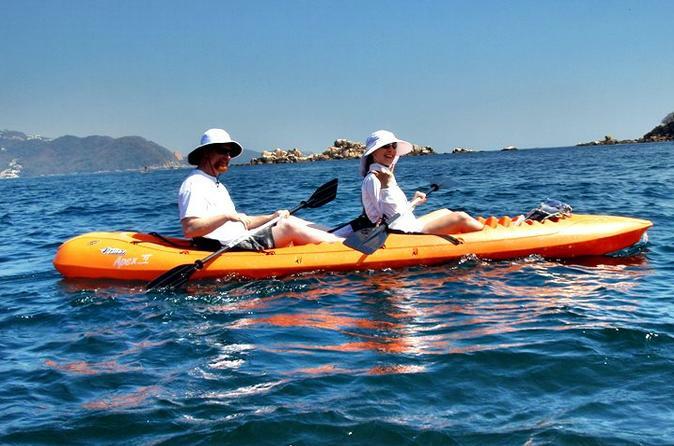 You will thoroughly enjoy our kayaking tour exploring and paddling in the beautiful waters surrounding Roqueta Island, a little island in front of the famous Caleta, a romantic part in the old Acapulco. The tour takes about 3 hours and at the end you will savor a meal on the Caletia beach. The experienced guides are helpful, kind, funny, and will give you a short introduction before you embark on the journey. Kayaks are available in doubles or individually. On the tour a water bottle is also included. Be sure you bring your own sun protection, like sun cream, sun glasses etc.